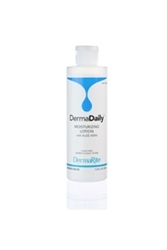 DermaDaily Moisturizing Hand & Body Lotion is a fast acting lotion that provides deep penetrating dry skin relief. It replenishes and enriches the skin’s own natural oils to provide long lasting protection. It is soft and mild, non-greasy and is even ideal for massage therapy. 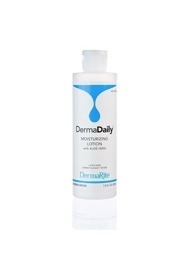 DermaDaily Lotions is perfect for use after showering, after diaper changes, and for daily skin therapy. This lotion makes my skin soft to work with patients. Prefer the therapy cream over this. This is a little too runny but it does a good job. Very good service, product received sooner than expected.